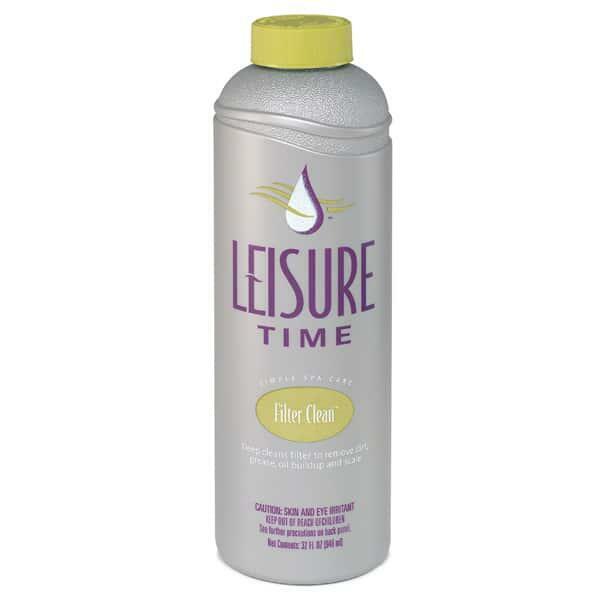 Leisure Time Filter Clean comes in a 16 oz or 32 oz bottle and works to clean spa and hot tub filters for optimal performance and longevity. The Filter Clean spa chemical removes dirt, oil, grease and scale from hot tub filters so that the filters may continuously complete its job. The Filter Clean is compatible with cartridge, sand or DE Filters. The new Leisure Time Filter Clean is stronger than any other filter cleaner and works overnight. It's compatible with all sanitizers, including bromine, chlorine and biguanide. The Filter Clean by Leisure Time is ideal for regular use in order to improve water clarity, rid the spa water of bacteria and increase filter life. Family Leisure recommends application of Filter Clean every other month for increased filter performance and longevity. For quick in between cleanings, use Instant Cartridge Clean. Cleans filter in 5 minutes.